Promotional water bottles are fantastic promotional tools, an excellent way of promoting your company or organisation’s message whilst proactively encouraging people to keep healthy and hydrated. They are an ideal promotional product to use in today’s very health conscious society. They are designed to be used every day, thereby dramatically increasing the potential effect of your promotional message. Having supplied promotional water bottles to many organisations in both the private and public healthcare sectors and these clients are very keen on using promotional water bottles to get their message across from general healthcare awareness to heart health and promoting health advice centres. Promotional water bottles are very popular in schools and other educational establishments, either for use as a fundraising product or a low cost giveaway to students. They are an ideal product to give out to anyone involved in regular sporting activities. Around 60% of our body is composed of water (55% for women), the brain is 70% water and the lungs nearly 90% water. Our blood is approximately 83% water, this assists in digesting our food and cleansing and detoxing our systems by aiding removal of waste materials. From our experience promotional water bottles are better as a gift handed personally to a client or individual. By their very nature, they tend to be quite bulky so may not always be the most appropriate product for a mailing campaign, however at less than 50g (empty weight) for a 500ml PE sports water bottle, they are very lightweight to transport, although by Royal Mail post would need to be sent as a Packet. The first option to consider when using promotional water bottles is whether they are to be used once only and disposed of, or intended to be re-used on a long term basis. Firstly the single use option, promotional bottled water: it is possible to personalise the type of plastic or glass bottled water that we are familiar with in the supermarkets and other retail outlets. This is typically done by means of a printed paper or polythene wraparound adhesive label as the most cost effective option, particularly with larger volumes. Alternatively the logo can be directly printed (usually by screen printing) onto the bottle, this is particularly suitable for simpler designs with less colours. This is an option mainly for glass bottles and is also more costly, therefore tends to be done with more expensive brands. Secondly, the re-useable option. 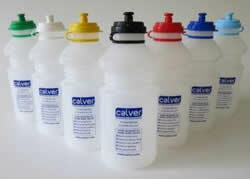 Promotional water bottles, more commonly known as sports water bottles. They are often manufactured from PE (Polyethylene). The lower cost and more commonly used versions are made from LDPE (Low density polyethylene) which is a more flexible version of PE. It can be translucent or opaque white or coloured. LDPE is widely used for making various containers, dispensing bottles, tubing and it’s most common use in the manufacturing of plastic carrier bags. It has an excellent resistance to water, can withstand temperatures of up to 80 degrees centigrade continuously and is fully recyclable through remelting. Promotional water bottles can also be manufactured from polycarbonate which has high impact resistance and is very durable. It has very good optical clarity (hence is often used in spectacle lenses) but has low scratch resistance, therefore often has a hard coating applied. You should ensure however that the promotional water bottles are made from ‘food grade polycarbonate’ and carry the relevant FDA or equivalent certification. It is said however that the polycarbonate may leach Bisphenol A (BPA) when in contact with water. The more expensive promotional water bottles available on the market are commonly manufactured from aluminium or stainless steel, which are both lightweight and durable. However due to their higher cost, tend to be more suitable for lower volume promotions or where a product of a higher perceived value is required. One factor to be aware of is that Aluminium (or Aluminum outside Europe) is not food safe. You should therefore ensure that the aluminium used in the promotional water bottles you are buying or using, has been lined with a ‘BPA free’ coating. Should I Go for Then? My recommendation for your own reusable promotional water bottles would be to either go for the PE bottles for a low cost volume promotion or stainless steel sports water bottles where a lower volume, more premium item is required. Bottles can vary in size from around 250ml to up to 1litre. The 250ml or 333ml sizes are ideal for daily use by younger children (5 – 10 years); these are great for packing inside a lunch box. I have found that the 500ml/650ml is the most typical size requested for promotional water bottles, it is not too heavy when filled and still reasonably compact and suitable for storage on inside or outside of bags or rucksacks. It is also a manageable size of bottle to hold in hand, if necessary, when running or walking. The 750/800ml size is ideal for adult daily use or 1Litre for adults only, ideal for extreme sports and for when more liquid is required. Which Cap or Top Do You Need? Push-pull valve: this valve will allow the water to flow freely from the bottle when opened. A faster flow can be achieved by squeezing the bottle. This type of valve is available in various sizes depending on the water flow required. Hands-free or one way valve: this valve is self-closing; water will only flow from the valve when the bottle is squeezed. The advantages of this are that dirt, dust or contamination cannot get inside the bottle via the valve and will not leak water from the valve if bottle is on its side or upside down. These caps are ideal for use with young children where the alternative push pull cap may be difficult for them to use or elderly users where manipulation of closures is also challenging. They are also excellent for example for cyclists, drivers or runners where it is more convenient or just safer to use one hand for the bottle. Promotional branded water bottles with labels (generally the pre-filled, single use type, disposable glass or plastic bottles): don’t clutter up your artwork with fine detail. Just keep the key facts of your message. Most of these labels nowadays are digitally printed in full colour so make the most of this by making your design more attractive, perhaps by adding a photo of the product your are promoting or in the case of a service making the use of alternative colours to make your contact details stand out. Promotional water bottles with direct print (such as the PE or stainless steel sports water bottles): again use concise clear message. As the print area is generally quite large, I advise my client’s to consider adding a message promoting some of the health benefits of drinking water. Perhaps also add the eco-friendly benefits such as ‘this bottle is partly recycled, fully recyclable and ultimately biodegradable’ in the case of the Promosafe, Watersaver or Aquasafe PE sports water bottles that we use. You could also include ‘This bottle belongs to’ and a box where the recipient could write his or her name, in order to help avoid any confusion where lots of the same bottle are being used at an event. 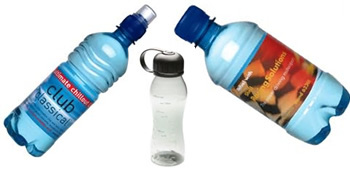 Typical minimum orders for promotional branded water bottles are around 50 – 100 units so ideal for promotional or sponsorship opportunities of local football teams, athletics clubs, health clubs, gyms or spas or other leisure activities such as tennis, climbing, walking, sailing, horse riding, dancing or martial arts. So as you can see, there are a few things for you to think about before choosing a water bottle that’s right for promoting the business. If you need further advice, help or would like to ask us a question please contact us.